Last Friday, I wanted to try something a little bit more tropical than the Georgetown Club Cocktail from Charles H. Baker, Jr.'s South American Companion: Up & Down the Andes with Jigger, Beaker, & Flask. The pisco drink I found was made for Baker at the Lima Country Club in Peru. 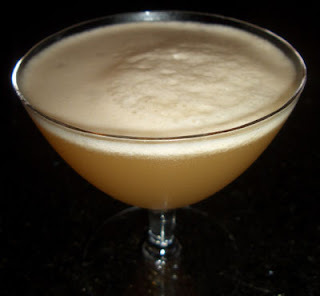 The pineapple juice was listed as optional but it seemed like it would make a delightful addition; furthermore, Baker listed alternatives for the apricot liqueur including Curaçao, Cointreau, peach liqueur, or either Chartreuse. We chose to stick with the apricot; however, the idea of yellow or green Chartreuse in this drink seemed like it would definitely score as a win. The drink started with a lot of pisco aroma with some pineapple and apricot notes. I was impressed at how aromatic and flavorful the Macchupisco was especially compared the bottle of César we had just finished. The pisco and lime juice did a good job of drying out the drink such that it was pleasant but not overly sweet. Moreover, I was a little surprised that the pineapple and the apricot flavors were hard to differentiate in the mix, but they did help contribute to the Pisco-Apricot Tropicál's round fruity flavor.